Second, current trends in both government and culture are moving towardredefining marriage as the union of any two persons, ignoring marriage's fundamental meaning and purpose as the universal institution that unites a man and a woman with each other and with children born from that union. The Church's social teaching is a rich treasure of wisdom about building a just society and living lives of holiness amidst the challenges of modern society. Modern Catholic social teaching has been articulated through a tradition of papal, conciliar and episcopal documents. The depth and richness of this tradition can be understood best through a direct reading of these documents. In these brief reflections, we highlight several of the key themes that are at the heart of our Catholic social tradition. The Catholic Church proclaims that human life is sacred and that the dignity of the human person is the foundation of a moral vision for society. This belief is the foundation of all the principles of our social teaching. In our society, human life is under direct attack from abortion and euthanasia. The value of human life is being threatened by cloning, embryonic stem cell research, and the use of the death penalty. The intentional targeting of civilians in war or terrorist attacks is always wrong. Catholic teaching also calls on us to work to avoid war. Nations must protect the right to life by finding increasingly effective ways to prevent conflicts and resolve them by peaceful means. We believe that every person is precious, that people are more important than things and that the measure of every institution is whether it threatens or enhances the life and dignity of the human person. The person is not only sacred but also social. How we organize our society -- in economics and politics, in law and policy -- directly affects human dignity and the capacity of individuals to grow in community. Marriage and the family are the central social institutions that must be supported and strengthened, not undermined. We believe people have a right and a duty to participate in society seeking together the common good and well-being of all, especially the poor and vulnerable. another, to our families and to the larger society. The economy must serve people, not the other way around. Work is more than a way to make a living; it is a form of continuing participation in God's creation. If the dignity of work is to be protected, then the basic rights of workers must be respected--the right to productive work, to decent and fair wages, to the organization and joining of unions, to private property and to economic initiative. We are one human family whatever our national, racial, ethnic, economic and ideological differences. We are our brothers' and sisters' keepers, wherever they may be. Loving our neighbor has global dimensions in a shrinking world. At the core of the virtue of solidarity is the pursuit of justice and peace. Pope Paul VI taught that if you want peace, work for justice. The Gospel calls us to be peacemakers. Our love for all our sisters and brothers demands that we promote peace in a world surrounded by violence and conflict. teaching its people to love, but to use any violence to get what it wants." "To a great extent, the story of America has been the story of long and difficult struggles to overcome the prejudices which excluded certain categories of people from a full share in the country’s life: first, the struggle against religious intolerance, then the struggle against racial discrimination and in favor of civil rights for everyone. Sadly, today a new class of people is being excluded. When the unborn child – the "stranger in the womb" – is declared to be beyond the protection of society, not only are America’s deepest traditions radically undermined and endangered, but a moral blight is brought upon society. I am also thinking of threats to the elderly, the severely handicapped and all those who do not seem to have any social usefulness. When innocent human beings are declared inconvenient or burdensome, and thus unworthy of legal and social protection, grievous damage is done to the moral foundations of the democratic community. The right to life is the first of all rights. It is the foundation of democratic liberties and the keystone of the edifice of civil society. 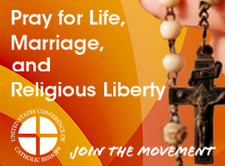 Both as Americans and as followers of Christ, American Catholics must be committed to the defense of life in all its stages and in every condition."